During the last 7 days EOS accounts for 6.5% of all blockchain activity. EOS surpassed Bitcoin in blockchain activity in less than a month. The most active cryptocurrecy for the last 7 days is Steem with 36.1%. Bitshares is in second place with 30.6%. Ethereum is in 3rd place with 16.4%. Bitcoin holds steady with 5%. All remaining currencies combined are at 5.5%. 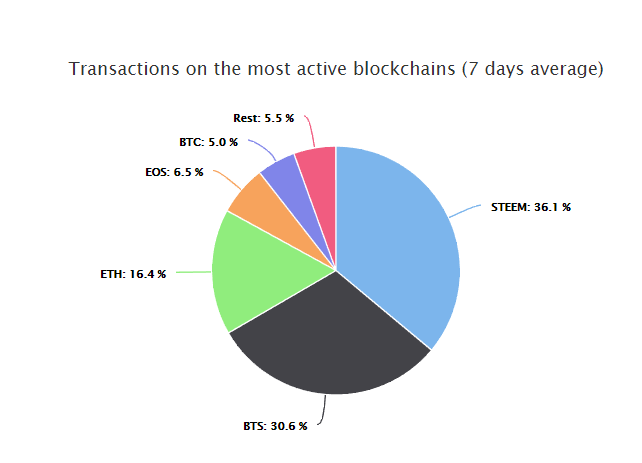 The most interesting thing about these figures is that the Blockchains of Dan Larimer, EOS, Steem, and Bitshares, account for over 72% of all blockchain activity. My question is, “When will the world notice and what happens when it does?” Many speculate that EOS will upstage Ethereum in the near future. As the usage of these altcoins increases, when does the price of Bitcoin become less important to the overall crypto market? I think we will see a decoupling of Bitcoin from the altcoin market in the near future. Previous Article← Will Dlike Be The Pinterest of Steem?